Last season Wisconsin-Green Bay had a future NBA draft pick in Keifer Sykes, and Valparaiso finished just three points shy of an upset over Maryland in the first round of the NCAA tournament. Neither led the league in offense, however. That was Oakland, which scored 1.11 points per trip in league play. 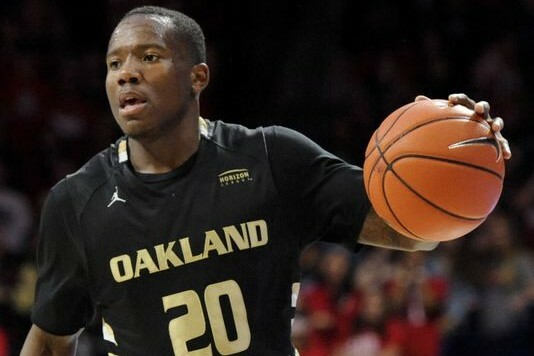 Oakland is led by maybe the most underrated player in the country. This might not be the Horizon League Preview so much as it is the Kahlil Felder preview. A 5-9 sophomore from Detroit, Felder led the nation in minutes played last season, playing in just under 96 percent of Oakland’s minutes. Whether the Grizzlies were getting blown out by Arizona, playing Iowa State tough, or cruising on a six game winning streak in conference play, Felder was on the floor. As if that weren’t enough, Felder finished sixth in the country with a 39.5 percent assist rate, meaning roughly 40 percent of the time someone scored while Felder was on the court, it was because Felder passed him the ball. Felder had just a 21.7 percent turnover rate as well, so him having the ball in his hands all the time is not hurting the team at all. It’s not just in the passing areas where Felder excels, however: Felder drew almost six fouls per 40 minutes despite being just 5-9, and he also shot 34.1 percent on 3-pointers. He is awesome. Sadly, the public likely won’t see the greatness of Felder in the NCAA tournament, at least this season. That is because Valparaiso won the regular season and tournament last season despite being one of the least experienced teams in the league. Valpo returns four starters and looks like a major threat to sweep the regular season and tournament again. The Crusaders finished 33rd nationally in defense and led the league, allowing .955 points per possession in league play, though they do lose their best defender to graduation. Vashil Fernandez had a 13 percent block percentage last season, good for 6th in the entire nation. If Valpo has trouble replacing him, someone could theoretically sneak up and win the league, but I wouldn’t bet on it.